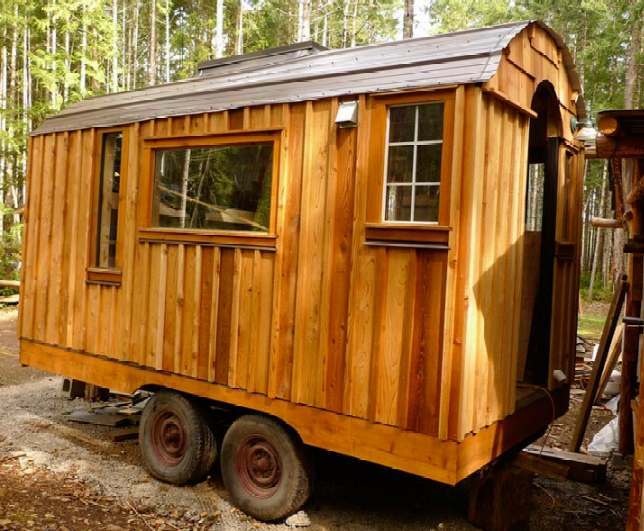 These folks lead a truly sustainable lifestyle and we should take out hat off to the development of affordable mobile wagons that minimize a person's carbon footprint. 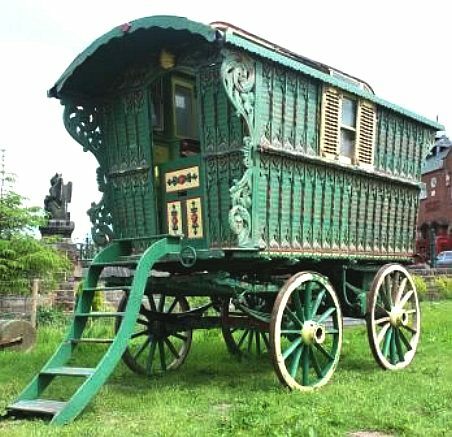 The English term gipsy or gypsy originates from the Middle English gypcian, short for Egipcien. It is ultimately derived from the Greek Αἰγύπτιοι (Aigyptioi), via Middle French and Latin. It was once believed that the Romanies, or some other Gypsy groups (such as the Balkan Egyptians), originated in Egypt, and in one narrative were exiled as punishment for allegedly harbouring the infant Jesus. The Oxford English Dictionary (OED) states a 'gipsy' is a member of a wandering race (by themselves called Romany), of Indian origin, which first appeared in England about the beginning of the 16th c.
According to the OED the word was first used in English in 1514, with several more uses in the same century, and that both Edmund Spenser and William Shakespeare used this word. This exonym is sometimes written with a capital letter, to show that it designates an ethnic group. The Spanish term gitano and the French term gitan have the same origin. During the 16th and 17th centuries the name was written in various ways: Egipcian, Egypcian, 'gypcian. The word gipsy/gypsy comes from the spellings which had lost the initial capital E, and this is one reason why it is often spelled with the initial g in lowercase. As time elapsed, the notion of 'the gipsy/gypsy' altered to include other associated stereotypes such as nomadism and exoticism. John Matthews in The World Atlas of Divination refer to gypsies as "Wise Women." 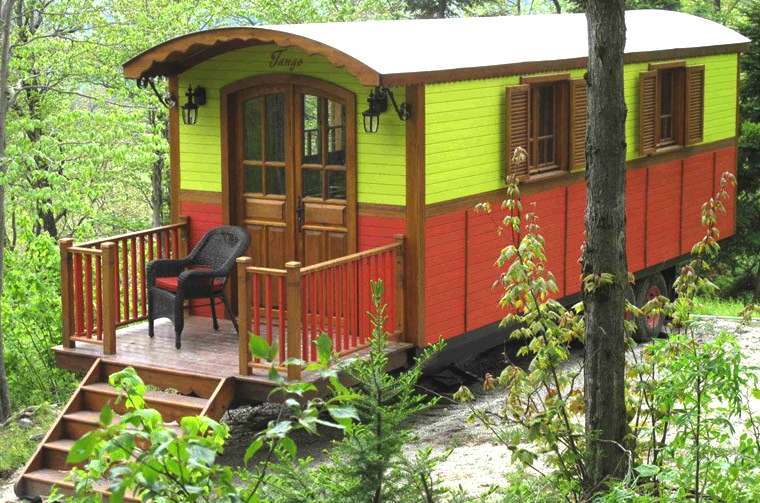 Colloquially, gipsy/gypsy may refer to any person perceived as fitting the Gypsy stereotypes. Encarta tells us that the Roma are divided into groups sometimes referred to as nations or tribes. These divisions generally reflect historical patterns of settlement in different geographic areas. The European tribes include the Calé of Spain, Finland, and Wales; the Sinti of Germany and central Europe; the Manouche of France; the Romanichals of the United Kingdom; the Boyash of Romania; and the Roma, a subgroup of the larger Roma population, of Eastern Europe and the Balkans. Although historically renowned as wanderers, the vast majority of modern Roma live in settled communities. 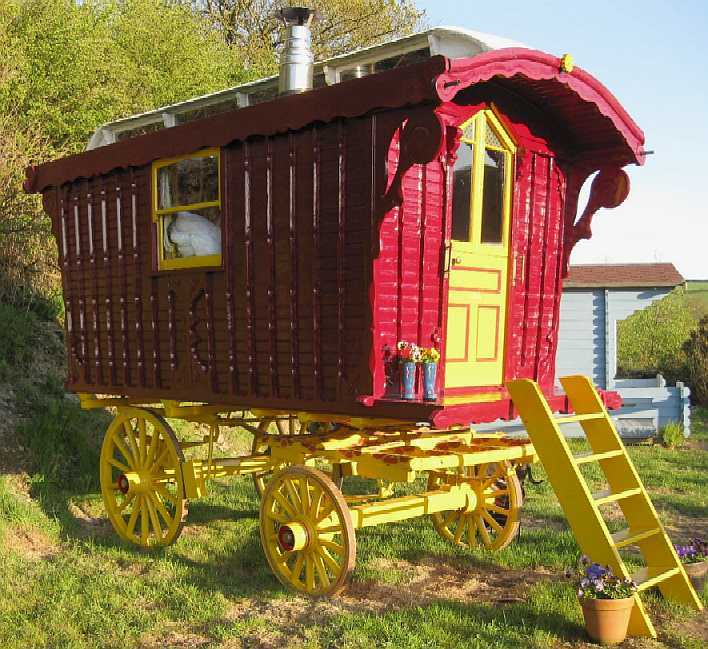 They are often referred to as Gypsies, Travellers, or Romany folk. 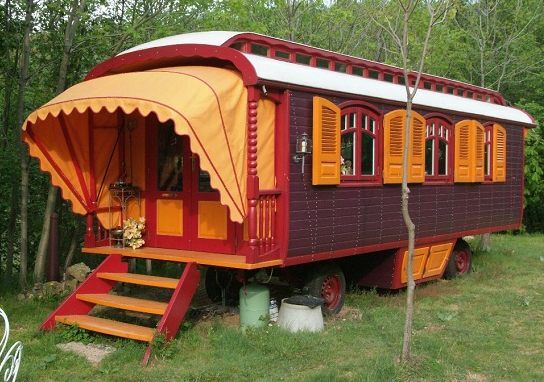 'Gipsy/gipsy' is a common word used to indicate Romani people, Tinkers and Travellers. It may or may not be considered to carry pejorative connotations by those so described, and use of the word "Gipsy" in English is so pervasive (and is a legal term under English law—see below) that many Romani organizations use it in their own organizational names. Gipsy has several developing and overlapping meanings under English Law. 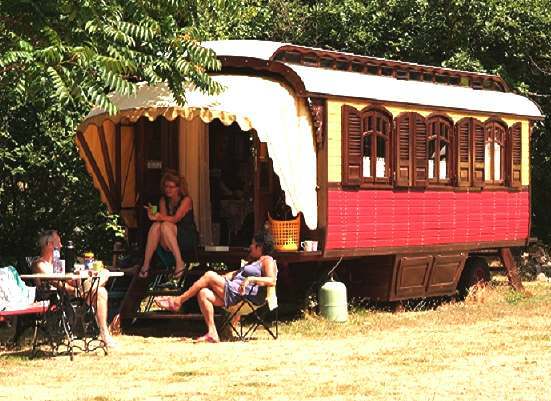 Under the Caravan Sites and Control of Development Act 1960, 'gipsies' are defined as "persons of nomadic habit of life, whatever their race or origin, but does not include members of an organised group of travelling showmen, or persons engaged in travelling circuses, travelling together as such." This definition includes such groups as New Age Travellers, as well as Irish Travellers and Romany. 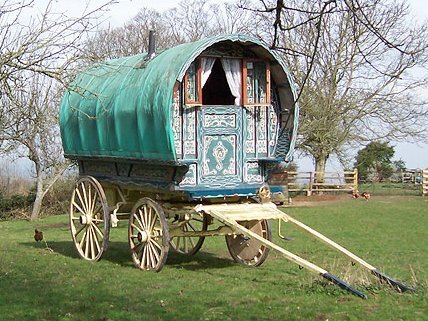 Gipsies of Romany origins have been a recognised ethnic group for the purposes of Race Relations Act 1976 since Commission for Racial Equality v Dutton 1989 and Irish Travellers in England and Wales since O'Leary v Allied Domecq 2000 (having already gained recognition in Northern Ireland in 1997). However, many Romani people find the term "Gypsy" offensive, and as a professor of Romani descent reports, even using the lowercase term is a process of erasure and normalization of hurtful term. Today there are still laws enforced that keep the Romani people from practicing their culture and keeping Romani people segregated. There is little doubt that council's across the UK have not provided for nomads and have embarked on a campaign to prevent settling, despite council failures. The conclusion can only be that many council's have an agenda to eradicate traveling people from their geographical region - a modern day form of the extreme Nazi eugenics from 1939. Yet, this lifestyle, if adopted more widely has the potential to reduce housing shortages and end financial slavery. Council officials may not like to hear that, but it is true. 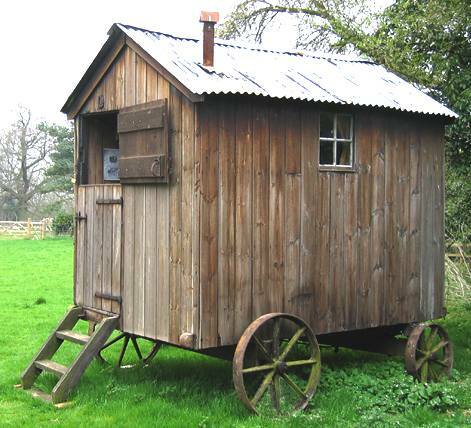 Sadly, history has seen the Gypsies persecuted for many reasons. Their roaming lifestyle caused them to always be the outsiders, belonging to no country. They were often viewed as vagabonds roaming the countryside looking to make a quick buck. Additionally their close knit, secretive behavior often caused fear and misunderstanding in those not of the Gypsies. Generations of Gypsies have endured persecution by the gaje (not of the Rom/Gypsies) as a result of their aura of strangeness. 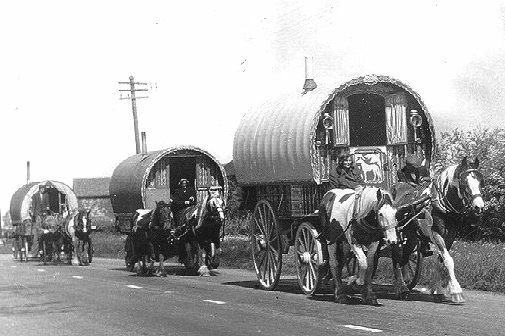 Political leaders have historically branded Gypsies as undesirables, making them scapegoats for local problems. 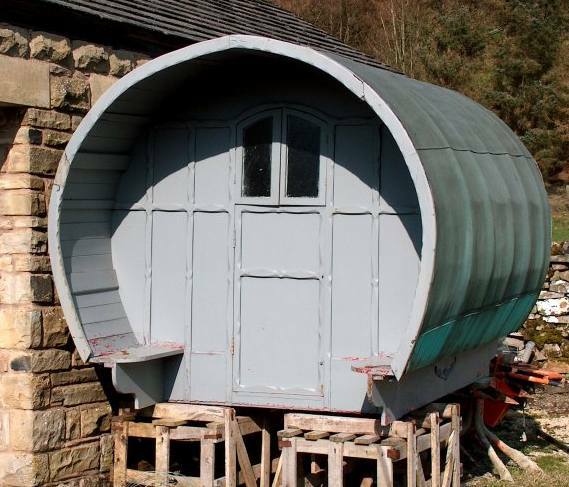 In the past it was common place for anyone who gave them refuge to be punished, anyone who killed a Gypsy could keep his property, any local authority who did not arrest the Gypsies in his area would have to pay for any damage they did. In May 2012, the Government highlighted that 232,000 new households are forming in England each year, but this new research has revealed that local authorities in England have now reduced their housing targets to around 160,000 per annum, a reduction of 13% from the Regional Spatial Strategies (RSS) housing target set for England. This equated to around 185,000 new homes per year, revealing a large discrepancy between the three figures of over 70,000 homes. The findings come from the third annual Housing the Nation report, which is put together by a group of property experts led by public and community affairs consultants Tristan Fitzgerald Associates (TFA) and BNP Paribas Real Estate, the leading property adviser, and looks at the challenge of delivering housing as well as putting forwards recommendations to the Government on how to improve delivery. Other experts who gave input to the report included: Liz Peace, Chief Executive of the British Property Federation; Ian Baker, MD of Linden Homes; Peter Truscott, Divisional Chairman at Taylor Wimpey; Pete Redfern, Group Chief Executive of Taylor Wimpey and Steve Morgan, Chairman of Redrow Homes. Join us in the drive for a green economy. Email or call to register your interest in these exciting sustainable developments for a better Britain. We are actively seeking development partnerships with a view to forming a consortium concerning bids for European, Canadian and other international research funding grants.